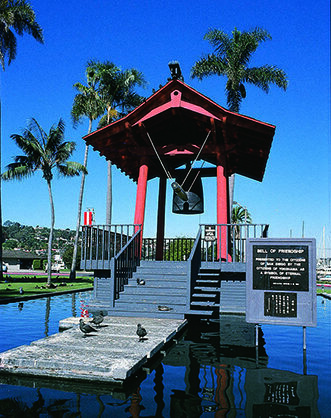 On a narrow peninsula in San Diego harbor rises a graceful Japanese bell tower surrounded by a moat. Beneath the sturdy beams hangs a massive bronze temple bell called a bonshō. It’s six feet tall and weighs two and a half tons. The bell is struck from the outside using a wooden beam suspended on chains. A bonshō’s deep tone can carry over twenty miles and reverberate for a full minute. The sound permeates to your bones. This Friendship Bell was a gift to San Diego from the people of Yokohama in 1958. After the terrible destruction of World War II, President Eisenhower founded the Sister Cities International program as a way to rebuild trust and friendship between nations. The pairing of San Diego and Yokohama was one of the first sister relationships on the West Coast. Yokohama’s gift is only rung on special occasions and New Years Eve when the local Buddhist Temple invites the community for Joya No Kane, the tolling bell ceremony. It’s customary to ring a temple bell 107 times before midnight and once just after midnight. The sound of the bell purges misdeeds, reveals illusions, expresses thanks, and on the last toll, offers a prayer for a fresh start in the New Year. 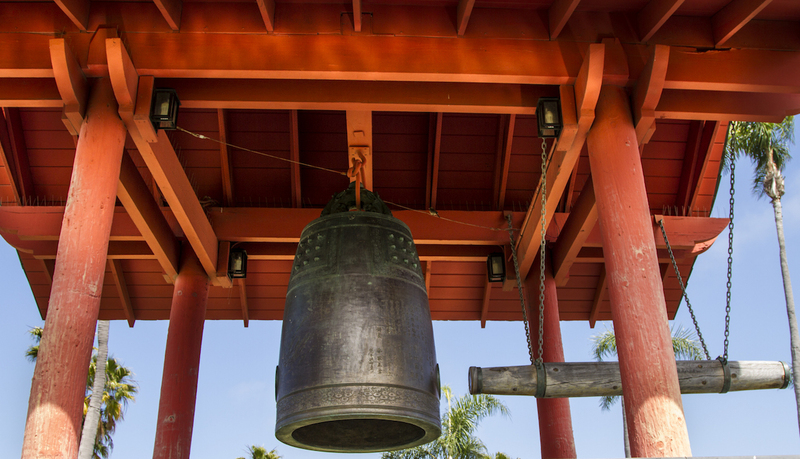 Buddhists believe the bonshō bells have sacred powers and can even be heard by people who have died — or are not yet born. I don’t remember being aware of any of these concepts when I was young and my family would go to ring the bonshō. I just remember the excitement of the gathering crowd and the anticipation as we were allowed to cross the moat and climb the steps toward the bell that I could easily fit inside. It took all my strength (and help from my dad) to pull back on the rope attached to the striker log. We’d swing it back and forth a few times, gathering momentum, then we’d let it hit the bell. The vibrations struck my body making it tingle and then continued out into the night like the pulse of the universe. I can still hear it ringing in my ears. I hadn’t thought about that bell for a long time but then the idea of Sister Cities came echoing out of the past. After the American “War of 2016”, I wondered if it might be a good idea for communities within the nation to become “sisters”? If foreign nations can rebuild trust and friendship, maybe the American people can do it too? Which begs the question, did President Eisenhower’s vision of Sister Cities even work? Did the people of San Diego and Yokohama learn to understand and trust each other after being mortal enemies? I think the answer is yes. I may have been a little kid but the significance of the Friendship Bell wasn’t lost on me. The bell’s creator, Katori Masahiko, said, “…part of the spirit of the bell is the wishes and prayers that the people who make [a bonshō] put into it.” And he meant that literally. All kinds of things might be added to the molten bronze before it was poured into the bell’s hand-carved clay mold — copper plates with the names of those who contributed, coins from around the world, broken swords, and even poems and prayers written on paper scrolls. The Japanese concentrated their hopes of peace and healing into the crucible, poured them into the bell, then shared them with us. We could feel it. What an amazing gift! They could have given us a statue but instead they gave us a sound. And not just any sound. A sound that carries through space and time. And there was something more. According to foundry bell maker Ikko Iwasawa, “The thing that matters is not the form, but the function, the content, the space inside. … in this space is the bell’s true meaning.” So, from a Japanese perspective, the Friendship Bell is a frame for whatever we might wish to fill it with. It is an emptiness created by peoples’ hope for peace. It is an invitation. This entry was posted in Arts & Culture, People, Places and tagged bonshō, Buddhist, Healing America, Ikko Iwasawa, Japan, Joya No Kane, Katori Masahiko, New Years Eve Bell Ringing, San Diego, Sister Cities, temple bell, Yokohama. Bookmark the permalink.